AC Plus Marine, Inc., is a woman-owned company which has been in business since 1994, mainly serving the commercial marine and diving industries. 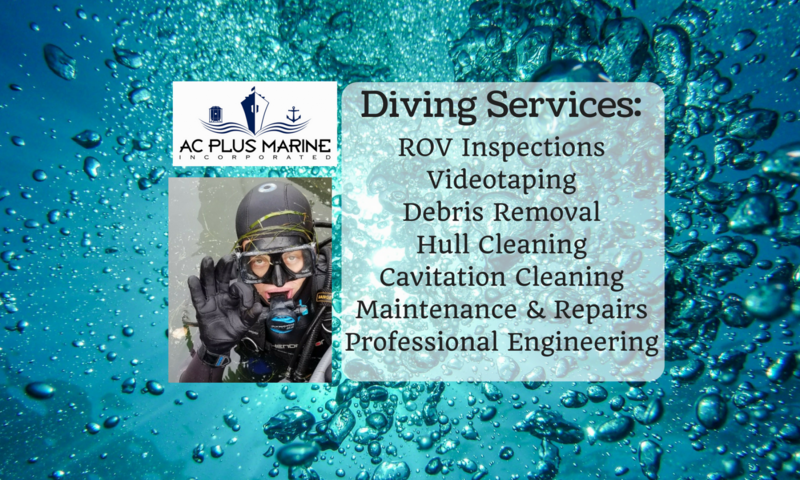 AC Plus Marine, Inc., now provides quality Diving Services including ROV inspections and videotaping, as well as debris cleanup, minor maintenance and repairs, and cavitation cleaning of hulls and underwater structures. In addition, through our professional engineering partner, Matrix Engineering, we provide design, engineering and project management for specialized underwater systems, structures and equipment. Our Mission is to provide the highest quality services to our customers while always keeping safety a top priority, and meeting or exceeding any applicable guidelines, rules, codes or standards.